This class was awesome, and Mr. Rehn is a very effective trainer. I encourage everyone who becomes interested to attend when you can and help make our gathering spots (including schools and churches) into better protected places. Deposit paid for the June 2-3 class and one friend has done the same - I'm hoping to have a colleague join us. Colleague wasn't certain enough of her skills under pressure, so I'm taking a friend and meeting another friend at the course. Super stoked. Yes, the standards are high. 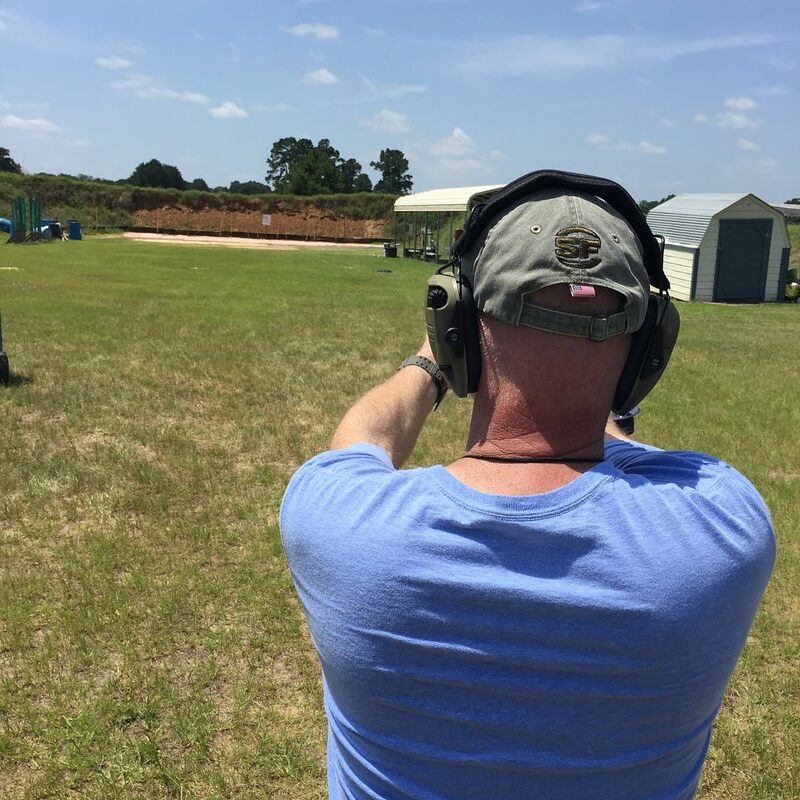 … pass the Texas License to Carry shooting test with a score of 90% or higher (225 points) and complete a 120 round Shooting Under Duress shooting exercise developed by DPS for this course. fire the shooting test from the NRA Defensive Pistol class, and the annual qualification course of fire used by a major Texas city's police department. I fired 318 rounds when I took the course last December. Ask questions, learn things, have fun! Karl has resolved the issues that previously caused error messages. I've tested the site and links myself and it is safe to go back into the water. A very sobering course. This isn't just "Watch out for innocents then shoot the bad guy" - there are a whole bunch of issues to be aware of. I won't go into any details here as folks should attend the class for themselves, but it was pretty eye-opening. We had an introduction and briefing in the morning, then wrote a pre-test exam. We then went straight to the range to shoot the LTC test (everyone passed), then we did the Texas DPS-required drills (interestingly not scored). Afternoon was mostly classwork then we went and shot 10 shots on paper at 50 yards, then hitting a steel plate starting at 30 yards and ended up at 75 yards - very few people needed a 2nd shot to hit it. The next day we were shown the 4 stages of a proper draw, proper reload-technique and as well as techniques for drawing from concealment - all critical in order to pass the NRA Defensive Pistol test which is all from concealment and pretty fast; there's no time to fumble and was definitely the hardest test to shoot clean - it takes just one miss to fail, so about half the class had to re-shoot it. Next we shot a major metropolitan Texas PD's qualification shoot (I was pretty chuffed when Karl pointed at my target and said "This is what a perfect score looks like!") then back to the classroom for more learning and drills. The shoot-house was next, learning to sweep and clear properly (in order to escape a building safely, not to engage the shooter) then back for some more classwork, tourniquet familiarization and then the final written test. Yep, highly-recommended - even if the DPS certificate looks like it was done by a dot-matrix printer. Last edited by AndyC on Mon Jun 04, 2018 1:21 pm, edited 1 time in total. I'm glad you enjoyed the course. Congrats on your excellent performance. I enjoyed meeting you and Rockie last Friday and hope to see y'all again. I'll be shooting in the USPSA at KR Training this Wednesday. This will be my third match. I'm finding that the skills I'm learning/improving through competition shooting are the skills I need for situations such as those covered in the School Safety/ Active Shooter course. USPSA may not work for everyone, but it works for me. For $20 I get to practice drawing from my holster, accurate shooting, discriminating between shoot and no-shoot targets, reloading and shooting while moving, all under time pressure. Yes, it is not totally realistic, but it helps me to evaluate and improve my skill. My opinion on competition - it doesn't have to be totally realistic. It tests your equipment so when something fails on the range, you can fix it before it becomes a Murphy on the street. It practices your motor skills so you can do various things without conscious thought - which then allows you to have full concentration on the tactical situation you're facing. It puts you under stress by having to perform against others and the clock, so it's a form of stress-inoculation and confidence-builder. It shows others doing things at a speed you might not have thought were possible, so it boosts your own performance when you try to replicate that.